Scene of the Blog Featuring Teresa of Views from My Highland Cottage! This is a bittersweet post: the last Scene of the Blog. It's been a good run, and I've met many wonderful book bloggers through this weekly feature. I can remember asking other bloggers on Twitter if they thought this idea would fly. Little did I know that it could-- and would-- for four years. If you're visiting from Teresa's blog-- Welcome! I'm glad you stopped by to see the wonderful spots where she reads and blogs. If you'd like to see any of the photos in larger sizes, all you have to do is click on them, and they'll open in new windows. There are some very large photos, and for those (once you have them up in a new window) you may have to click on them again to get them full size... just because Blogger likes to be contrary that way. Once you've feasted your eyes on Teresa's book haven, you're more than welcome to take a look at previous participants' spaces. Click on the Scene of the Blog tab at the very top of the header on this page. There are two ways to search: by Blog Name or by Location. Now, let's go on a very special tour. I've always hoped I'd find a book blogger with one certain item in the home, and Teresa's got it! A variety of views can be found in my blog, Views From My Highland Cottage—book reviews to be sure, but also views of life in a National Historic District, plus photographic views of our house, hobbies and travels. Believe it or not, Louisiana does have some land above sea level and our neighborhood is a bit higher than land originally settled in Shreveport, the mid-sized city in Northwest Louisiana where I live and write. The Highland in the blog title is named after the Highland neighborhood where my husband and I live in our large, rambling white frame house. Hidden behind our house is a small guest cottage, built of recycled materials in the early 20th century. It is here that I often tuck myself away in a corner to read and write. In an old gold brocade wingback chair my sister-in-law gave us, my legs propped on a yard sale hassock, toes touching my books, I happily spend hours in the evenings. I’m a relative newbie to blogging but I’ve kept lists and synopses of books read for years, and I’ve journaled my every mundane thought-- I mean profound perspective on life-- off and on since I was a teenager. My friend, Jennie, creator of A Garden Carried in the Pocket that has been featured in Scene of the Blog, came over one Saturday last March and helped me set up a basic blog, and I’ve been learning about blogging by doing it ever since. There is so much more I want to learn to make my blog more visually appealing and organized. For now I’m happy when I find time to post. Our house has many nooks for reading and writing so it’s a wonder I make it to work on any given day. I could just move from spot to spot, reading and writing, all day long. 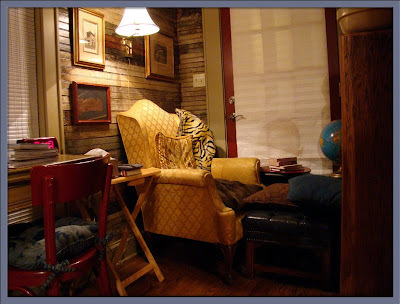 An alternate space for reading in the cottage is the sofa if I tire of cramming myself in the cozy corner. ...but my favorite blogging area is my library where the majority of my books find a home. In the winter I can be found reading on the love seat in the library next to the old Dearborn heater. Upstairs on the landing is another spot hidden away for more books and stolen moments for reading while life continues on the first floor. Reading in bed? You bet! Of course every reader goes to bed with a book and, in my case, my journals. My husband’s father was born in this bed so it has been in his family for a long time. I love the grandeur of this reading spot, but I do need a foot stool to get into bed! I’m an educator and have been most of my life. I love learning new things, seeing new places and meeting new people. The blogging world is one just opening up to me and I look forward to more explorations of its many facets and possibilities. Thank you so very, very much for taking us on this tour of your lovely home and its many spots for reading, creating, and contemplation. You're an inspiration, Teresa! Your blog is one that I enjoy reading very much, and I know that your readership will grow and grow! While I'm on the subject of thanks, I'd like to thank each and every one of you for your support and your participation during the four years I've run this feature. To all who shared their reading and blogging spaces, to everyone who faithfully showed up each week to check those spaces out, it's been a marvelous run. I already subscribe to the blog above and it is lovely but this doesn't have to do with that. I wanted you to know that google reader is not giving us your updates. I have tried deleting and readding your blog to my reader several times and went through the website and specifically clicked on RRS feed and all of them stop at Sept 11th and won't update past that. I thought maybe you were ill or something drastic happened because I love your blog. Could you see maybe what is going on or if it is something I am doing wrong? Thank you!!! All the reports I get weren't telling me of any problems, so THANK YOU for the heads up!!! I've done some research and tweaked a thing or two. Hopefully what I've done has corrected the problem! I've been having some problems with your blog not appearing as well. Hopefully that's now in the past. Teresa's house and library are so wonderful! I love visiting, but have to admit to envy in the library with all of the colorful shelves and that LADDER! I have had the same problem that Watch me Read has had about updates with a couple of blogs. Frustrating. So disappointed that this is the last of these sneak peeks into other reader's blogging spaces, but you certainly ended on a high spot with this post! Now that you mention it, I haven't seen posts from a couple of normally prolific bloggers in my feed lately either. Hmmmm.... Nothing like having a blog problem that keeps me from finishing the laundry! Thanks, Jen for your help in creating my blog and appreciate the comments on my library, Jen and Cathy. My husband and our carpenter will be pleased that everyone appreciates the library ladder they ordered off Ebay and then had to figure out how to hang it! Cathy, I am having the same problem with Google Reader and thought it was just something I had inadvertently done. No, I think Google has inadvertently done something, bless their hearts (and I mean that in the true Southern sense). I want Teresa's cottage and library! I'm heading over to her blog now. I'm sad to see this feature go but four years is a great run! It was good to visit with you on my blog, as you can see, I am a football fan! Thanks for being one of my stars, Kathy! I'm in love with her cottage! And I want that reading corner so badly!! @Vicky. I do love my reading corner. As my relatives note, they practically have to shove me out the front door of the cottage if they want to visit Louisiana and stay in the "guest" cottage. It's really a shame that this feature will end. I look forward to it every week. I had somehow forgotten that this would end -- perhaps a "Freudian" slip -- but recall that you wrote about how bloggers weren't replying to you and that it was becoming more difficult to get responses to do this feature. Meanwhile, I'm drooling with envy at Teresa's house, library, cottage and the many reading spots. Not only is it all well-organized, clean, neat, but esthetically pleasing with lovely colors. It all calls out to readers to come and sit and read for hours. I'm going to miss this feature, I'm glad I got to particpate before it ended its run. As for the blogging space - I don't know if I envy the reading nook/guest cottage or the library ladder more. Probably the library ladder. Amazing! roryeoconnor--for me, the two things on my Must Have List when we were looking for an older home to buy was a cottage in back and a library ladder. I feel very fortunate to have gotten both and then some! I hope you will wander over to my blog for more views of life in this historic southern central city neighborhood! I'm glad you got to participate, too, Rory. You have such a lovely home, and I'm glad we could share it with others. Oh, I'm really going to pine over that library. The green shelves are perfect, with the bit of wood interspersed, with lots of books showing. Then a loveseat. I live in the Big Apple. One would have to be a millionaire, or else live out in a big house in the Bronx, Brooklyn or Queens, to have a room set aside for a library. But one can dream! I'm sorry to see this feature go but it was fun while it lasted. Actually what I need is to do less blog reading and more book reading. It's so distracting, but I love my bloggers. There are just too many darned distractions from my reading! I could've been reading last night, but was I? Noooooo... I had to go to the Poisoned Pen for an author event, listen to and talk with TWO wonderful authors, and wind up being... coerced (yeah, that's it... coerced) into buying three more books! Poor baby! :) I hope they didn't twist your arm too hard. Oh, Teresa - what beautiful spaces! I'm so glad to have gotten this peek into your home, and your blog (to which I've subscribed btw). Thank you, Cathy, for 4 years of treats & introductions to some great blogs! I thought you might like Teresa's blog, Debbie. (Sometimes I just get one of those feelings.) Thank you so much for being one of my Scene of the Blog stars. People like you-- and Teresa-- and so many others are what made it a success. After scrolling through way too many troubleshooting pages, it wasn't until Denis and I were driving to the Poisoned Pen that I isolated the problem. Hopefully it's fixed now and everyone will get the full feed. What chaps my hide, though, is that many of my readers didn't get notification of this wonderful end-of-run post from Teresa! Sometimes one just wants to read! Turn off phone, shut down email, and just settle into a cozy nook, with tea and cookies and read! Oh, if only we had special days of the week for reading, or extra hours in the day just for that purpose. However, life comes along when we have other plans ... always. And even though I do spend time reading great blogs like this one, instead of doing more reading, it's well worth it. One gets to meet other readers and learn of opinions of books and comments on so many things. For someone like me, who is mostly at home, this is one of the benefits of the Internet, getting to meet so many people and read what they have to say. It's socializing and all good. So, my kudos to all bloggers, especially those who read! Wow...what a beautiful home you have...so cozy. And the library is to die for. Thanks for featuring Teresa today. I have visited your blog before, Teresa...it is just as wonderful. Stop by my blog for a giveaway of five e-books if you like. You can hang out at my blog any time, Teresa! This was wonderful. LOVE the ladder! Lots of welcoming places to read there. Sorry this is the last. I am one of those you asked a long while ago, and I felt too shy (or something) to do it. Silly me. There's no reason to feel badly, Nan. You have to do what feels right for you. That's why I never badgered anyone about being a participant.